University of Florida’s Conservation of Amphibians and Reptiles class investigate an active tortoise burrow with Archbold’s Betsie Rothermel. 17 October 2009. 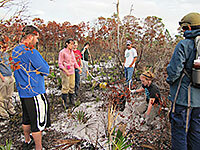 Introduction: Many college classes have visited Archbold Biological Station to experience the varied regional habitats and to learn the techniques of field ecology. Soon after WW2, Richard Archbold established a long-standing tradition of welcoming college classes and of providing comfortable facilities and an exciting "new" ecosystem for students to study. Although Archbold does not offer formal course work many visiting classes from colleges and universities around the country regularly use Archbold to conduct field courses or carry out independent research projects. Archbold hosts a wide variety of classes, including undergraduate and graduate level, and both 2-and 4-year colleges and universities. Classes at Archbold have ranged from traditional field ecology to geology, landscape design and planning, environmental law, and fisheries. Archbold encourages self-sufficiency in visiting faculty and their classes, but see guidelines for potential use of Archbold staff by visiting classes. Applications, Guidelines for Station Use, and Liability Waivers: Archbold facilities are available by prior application. Please review information under Visitor Information, and Guidelines, or contact the Facilities Coordinator for arrangements. All students and faculty must sign our liability waiver. Faculty and students should review Station visitor policies and information before conducting classes. Permits: Faculty must, themselves, obtain from their home institution and appropriate state and federal government agencies all necessary permits (IACUC, listed species, etc.) for use of animals in teaching such as small mammal traps, herp arrays, mist nets, AND any other class field or laboratory activities requiring permits. Station research permits DO NOT COVER visiting researchers and faculty with classes. Appropriate Lab Heads at Archbold must be consulted before seeking permits, and the Station must be copied on these permits before arrival. We recommend that classes do not undertake experimental or manipulative class research/teaching activities on threatened and endangered species. Facilities: The Station provides facilities for visiting classes; classes can be accommodated for up to several weeks. The most important teaching element, Archbold's 2,000-ha scrub preserve, lies immediately next to the laboratories and housing. The new Archbold property, the Reserve, is in the process of evaluation and there will be future educational opportunities at the site. (consult the Executive Director for inquiries in the meantime). Teaching projects in the scrub involving observational activities and minor temporary marking or tagging are acceptable throughout the Station study tracts on condition they meet all Station policies. Teaching must not interfere with ongoing research or land management activities, which take precedence; classes should check with the Lab Heads, the Land Manager, or Operations Manager before proceeding. More intensive sampling protocols by visiting classes or students must be reviewed with the appropriate Lab Head and meet all Station policies. The Station has published guidelines for faculty and students conducting fieldwork. Because of the nature of agricultural operations, all class and student activities at the Ranch must be pre-approved by the Research Biologist at the Ranch and/or the Ranch Manager who can inform faculty of ongoing agricultural operations and suitable field sites. Guidelines for visiting classes at the Ranch are under development. Year 3 Florida Project Biology class, University of Birmingham (UK) conducting research presentations in Archbold’s auditorium. 24 September 2009. Visiting classes may apply to use the two teaching laboratories, a large multi-purpose classroom and a smaller adjacent multi-user laboratory. Guidelines for the use of this classroom and this lab are available. Classes may also reserve the conference room and a 90-seat auditorium. Classes are welcome in the Library, which has holdings of 400 journals and a large collection of about 6,000 books, focused on ecology, evolution, behavior, and Florida natural history. Students have full access to Archbold's computer network housed in the Computer Information Center above the Library with quality Internet access via T1, and workstations with typical word processing, statistical, and spreadsheet capabilities. Basic Internet access and workstation/printer use does not require reservations, but classes needing access on Archbold's IntraNet need to contact the Station's Systems Administrator in advance. Several nongeospatial datasets collected at Archbold, including weather data, some plant and animal population data, groundwater table, water chemistry, and soils are available, some of them digitally, to augment teaching projects. Spatial data (e.g. Station imagery, boundaries, vegetation, soils, fire) are maintained centrally in ARC-INFO and some coverages are available by advance arrangement from the GIS Manager. A map directory includes links to a Station atlas and a Ranch pasture atlas which provide printable, one-page maps for property sub-units. Hard-copy vegetation maps of the Station are available from the Plant Lab for class use. Greenhouses, outdoor cages, and controlled environment rooms are available and housed separately (contact Operations Manager for assistance). At the Ranch, the Headquarters Building can hold small classes (<20) for lectures, but there are only limited lab facilities for visiting classes. Accomodations: Visiting students are provided full housing, laundry service, and meals, or can self-cater in the cottages. There are two student dormitories and seven cottages with kitchens for visitors. See the Schedule of Fees for current rates. One cottage, the auditorium, and parts of the Main Building are full-wheelchair accessible. Accommodations are no longer available for visiting classes at the Ranch. A few four-wheel drive vehicles are available for rental to provide access to the field; drivers have to undergo a training session. Vehicles need to be booked well in advance, are often in short supply, and priority is given to research. Students can easily walk to nearly all field sites, from the main buildings or from the public road. Recreational Activities: Swimming at Lake Annie is a popular activity. Participants for ultimate frisbee games are welcome. The lounge has a TV (no cable), DVD, and VCR. Our nearest town, Lake Placid (8 miles north), is a small rural community, but has all basic amenities such as supermarkets, restaurants, hardware store, banks, parks, etc. Reference Material: Other web pages on Archbold's site contain much material relevant for visiting classes; we encourage you to browse extensively and some of these pages are referenced throughout this section. A useful short bibliography includes important publications about the Station's history, geology, ecology, and biodiversity. An excellent 19-minute Video, "Islands In Time," about the Station and the Lake Wales Ridge is available for viewing and we recommend faculty purchase this video from the Main Office to preview Station habitats with students before arrival. Students are encouraged to take a virtual guided tour of the station's Nature Trail before arriving. The Station's entire Scientific bibliography, STABIB, including over 1,700 references (through 2008), is published on the Station's web site. Additional Ranch information can be found on the BIR web pages. Archbold printed materials including the Fire Management Plan, Roger Morse's biography "Richard Archbold and the Archbold Biological Station," and other books authored by Station scientists may also be ordered from the Main Office. Principal Station Habitats: Terrestrial habitats available for study at the Station by visiting classes include pristine remnants of a disappearing xeric ecosystem endemic to the Lake Wales Ridge, characterized by mainly shrubby scrubs, temperate to sub-tropical in nature, with marked adaptations to drought and nutrient-poor sandy soils. Wetland habitats on the Station include the 90-acre sinkhole Lake Annie, which is of exceptional geological and ecological interest, as well as numerous seasonal wetlands. Major habitats are divisible into subtypes based on soil and vegetation structure, forming a complex mosaic. Vegetation maps are available as blueline hardcopies for the field, and some as GIS coverages, (contact GIS Manager), may be available to help design and implement projects for visiting students. Eckerd College’s Study of Reptiles and Amphibians class seining in borrow pit pond on Archbold’s Reserve. 22 January 2010. The Reserve: The Reserve, 3,648 acres, is a 2002 purchase of adjacent pasture-land by Archbold Expeditions. Archbold’s long-term goals for the property are to restore the natural communities and ecological processes on this site while retaining sustainable agriculture and other rural land uses, and detailed plans for the property will take time to develop. Access is not fully developed yet and visiting classes should contact the Executive Director for use at present. Buck Island Ranch. Buck Island Ranch , located 13 km east of the Station, is characteristic of today's Kissimmee Valley ecosystem, and exhibits diverse terrestrial and aquatic habitats, both natural and artificial. About half of the pastures have been modified with drainage ditching and introduced Bahia grasses, the rest are semi-native and there are over 500 small seasonal and permanent wetlands scattered across the landscape. Forested habitats include cabbage palm thickets, palm-oak hammocks, and live oak woodlands. Species Information: The biodiversity inventory on the Station's main property thus far includes 25 fishes, 21 amphibians, 47 reptiles, 208 birds, 44 mammals, 575 vascular plants, and about 4,500 insects and other arthropods, including the greatest diversity of ants (114 species) known from a single site in North America. The biodiversity inventory of the Buck Island Ranch thus far includes 19 amphibians, 34 reptiles, 161 birds, and 31 mammals. The unique upland habitats of the Station and the Ranch contain a plethora of endemic plants and animals, 42 of which are currently state or federally listed threatened and endangered species. Land Management and Conservation: Archbold's land management program provides a multitude of teaching opportunities. Management practices at the Station demonstrate fire management as a key component of research design and conservation needs. Prescribed burning is used to maintain long-term native species composition and structure, and to test hypotheses about responses of native systems to different fire regimes. Although visiting classes are not allowed to participate in prescribed fire activities (for obvious reasons), the Land Manager can give advice on the prescribed fire program and suggest areas which demonstrate the role of fire in this ecosystem. Some fire histories, including natural and prescribed fires, are available to classes as GIS coverages, and discussed in the Station's Fire Management Plan available from the Main Office. Students studying conservation biology at Archbold can learn about ecologists as concerned citizens and review Station conservation programs to detect changes in the status of species and ecosystem function at the regional level. The Station, in conjunction with The Nature Conservancy, has been instrumental in the ongoing acquisition of a network of biological preserves to protect the endangered scrub habitats of the Lake Wales Ridge including the first National Wildlife Refuge designed specifically for plant protection. Seasons: The Station is busiest with visiting classes during the spring break period (March - mid-April). We encourage faculty to consider other times of year to visit when we are less booked up. For teaching purposes Archbold field seasons are year-round, with the growing season from spring through fall. Based on 50 - 60-year weather records, average annual rainfall is 53.0 inches with more than 60% falling during June-September. Brief afternoon thundershowers occur almost every day in summer. Mean annual temperature is 22.2ºC with average maximum summer temperatures of 33.5ºC. Winters are moderate, with infrequent cold spells below freezing. Haskell Indian Nations University’s Ecology class on interpretive natural history hike along Archbold’s nature trail with Education Coordinator, Rick Lavoy. 17 March 2009. Teaching Activities. At Archbold, the emphasis is on visiting faculty and students who can be largely self-sufficient while at the Station. However, we encourage classes to ask relevant Program Directors and staff for guidance on appropriate teaching activities, locations for specific fieldwork, and use of equipment. Good ideas for successful activities with visiting students may be found by consulting web sites and contacting by email other faculty who bring students to the Station. Since 1970, the biennial graduate field ecology class from Cornell University has built up an excellent collection of reports of student research conducted at Archbold, which are available for reference in the Station's Library. Station and Ranch scientific staff are sometimes willing, time permitting, to participate in classes on request (lecture, field tour, lab tour, access to field herbarium or view reference collections of vertebrates and invertebrates); however, these arrangements must be made directly with the Program Directors concerned, and well in advance. Education staff is available, with prior arrangement, to give a slide show covering a general overview of research at Archbold or give an interpretive guided tour along the Station's Nature Trail. Archbold's Grade 3-5 curricula material, derived extensively from Station research, is distributed to elementary schools in 26 counties in Florida, and at discoveringflscrub, and has useful information for all age-groups. A Ranch "swamp buggy" tour of research projects at BIR is available for classes of up to 18-20, although there is a charge for this tour and arrangements must be made in advance with Ranch staff. Academic Community: Archbold encourages interactions among visiting classes, staff, visiting researchers, and interns, in formal and informal settings. Visiting classes emphasize field projects, and many return biennially. Visiting classes may attend seminars - there are 10 - 20 scientific seminars every year, usually monthly, 3:30 p.m. on Thursday afternoons. Other Regional Sites: Many classes use Archbold as a base for field trips to other ecosystems throughout south-central Florida. The text, "Ecosystems of Florida," (Myers and Ewel 1990), is an invaluable resource for courses dealing with Florida ecosystems (for sale in Archbold's Main Office).." The Florida Atlas Gazetteer, by De Lorme, is an excellent (1"=2.3 mile) map book for planning field trips (for sale in the Main Office). Other references also for sale include Susan Cerulean and Ann Morrow's "Florida wildlife viewing guide" (Falcon Press), Bill Pranty's "A birder's guide to Florida" (American Birding Association) and Tim Ohr's "Florida's fabulous natural places" (World Publications). Archbold is ideally situated for teaching and excursions, within easy driving distance of many publicly owned wetlands, forests, and coastal sites, many of which are included in our Regional Exploration web pages covering a wide range of Florida's ecosystems and physiographic regions. The Table gives approximate driving distances and links to those sites already on the Web. Additional information can be found in a partial compendium of wildlife viewing sites compiled by the Florida Fish and Wildlife Conservation Commission and state parks can be found in Florida Department of Environmental Protection Web Site. The range and number of sites regionally reflect Florida's highly successful land acquisition programs Preservation 2000 and Florida Forever, as well as many federal programs.